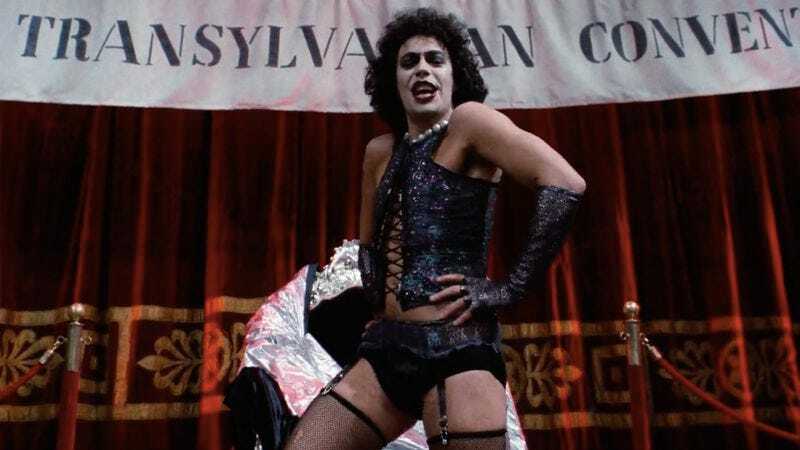 When a 28-year-old Tim Curry burst onto movie screens and into the public consciousness amid scandalized shrieking and glam-rock power chords in 1975’s The Rocky Horror Picture Show, he was a manifestation of the danger and excitement of sexual liberation and gender fluidity. His caped and androgynous mad scientist Dr. Frank-N-Furter stood in stark contrast to the stuffy, upper-crust Criminologist Narrator, played by the 46-year-old character actor Charles Gray, who remained safely removed and ever-judgmental of the lascivious events he recounted from his office. Now, 40 years later, a 69-year-old Curry is stepping into the conservative Oxford shoes of the Criminologist Narrator for Fox’s upcoming “reimagining” of the cult musical. “I am very happy and excited to be a part of this new event,” the film and TV veteran said, likely in a pleasant tone of voice that could never be considered threatening to middle American values. Transgender actress Laverne Cox (Orange Is The New Black) will take over the role that Curry originated on the London stage in 1973, imbuing the enigmatic antagonist with as much edge as can probably be expected from Fox’s primetime follow-up to Grease: Live. Other cast members include Ryan McCartan and Victoria Justice as the terrified protagonists Brad and Janet (played in the 1975 film by Barry Bostwick and Susan Sarandon), and Glee’s Adam Lambert as scary, sax-playing greaser Eddie (played onscreen by Meat Loaf).